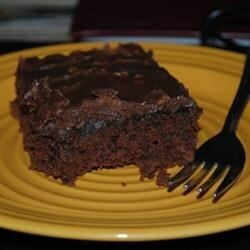 "Good old fashioned chocolate cake with homemade chocolate frosting. A family favorite for many many years." Preheat oven to 350 degrees F (175 degrees C). Grease and flour a 10x15 inch jellyroll pan. In a large bowl, sift together the flour, sugar, baking soda, cinnamon and salt. Set aside. In a saucepan combine 1/2 cup margarine, shortening, 1/4 cup cocoa and water. Bring to a boil and cook for 1 minute. Pour the liquid mixture over the flour, sugar mixture; stir well. Blend in eggs and buttermilk. Pour batter into prepared pan. Bake in the preheated oven for 30 minutes, or until a toothpick inserted into the center of the cake comes out clean. Let cake cool 10 minutes, then frost while still warm. Very moist cake! I added some chocolate chips to make it more "chocolatety". Really good. I used butter instead of margarine. Some chopped walnuts in the icing would be good, too. Just made this for my son's 9th birthday. He is a chocolate lover and he and his friends ate until the last bite and asked for more. Said it was the best chocolate cake ever! Just like mom used to make. Takes a little more time, but worth in! !